This ticket gives you an access to the fair with meet and greet for 2 days. Present your ticket with bar code upon entry. This ticket gives you an access to the fair only for 2 days. Present your ticket with bar code upon entry. This ticket gives you an access to the fair with meet and greet for 1 day. Present your ticket with bar code upon entry. This ticket gives you an access to the fair only for 1 day. Present your ticket with bar code upon entry. 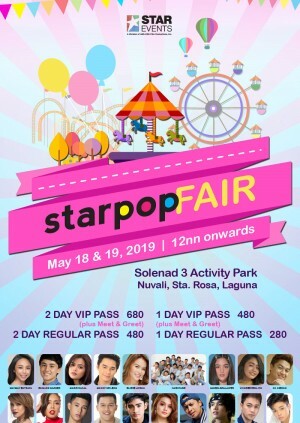 Star Pop Fair is a fun-filled event that gathers all fan-based young music artists with huge millennial following. Experience an event filled with interactive activities, open mic, mini bazaar and a concert by STAR POP artists.